Meet Buddy, created by Blue Frog Robotics, a French-based company. Buddy can patrol a home and alert residents to an intruder or a fire. The robot revolution has arrived at the Consumer Electronics Show in Las Vegas this week. Among those on display are a robotic arm that plays table tennis with a human opponent, and a larger-than-human robot that plays the word game Scrabble against another player. Many tech companies from around the world are developing robots that act as social companions that can be a part of the family. Imagine a mobile device, such as a tablet, with a moving body and personality. Many social robots have faces with blinking eyes and moving mouths and different expressions. One robot even yawns. Some speak in various languages while one sounds like R2-D2 in the Star Wars movies. This Scrabble-playing robot was showcased by Industrial Technology Research Institute (ITRI), a Taiwan-originated group. “This year, I think is the first year we can touch this revolution,” said Rodolphe Hasselvander, founder of Blue Frog Robotics, a French company that created the robot named Buddy. 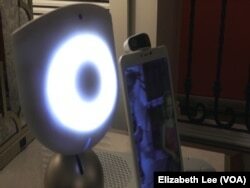 Several robotic social companions that interact with people will be available for sale this year. “This is like humanoid. It’s good for maybe the elderly, for children and for adults to have interaction,” said Sean Wang, general director of the Industrial Technology Research Institute International Center. They can do what a smartphone can do and more. Some robots can entertain children. The robot Buddy can patrol the home when the residents are not home and contact a person’s phone if it detects an intruder or fire. Many of the robots have cameras that act as eyes. For those concerned about someone hacking into a robot to peep into a home, there are safeguards to look for when purchasing one. “When the camera is activated, we will show it on the screen and specific lights so you know that someone is using your camera,” Hasselvander said about Buddy. He said 2018 is the time when people are ready to accept social robots into their homes. “This kind of robot is the next step because Amazon Echo, Google Home, can’t move. They’re not alive. It’s not a character you know. So it’s the next step. I think this robot, I hope it will be Buddy, but this kind of robot will be adopted by everybody in the next few years,” Hasselvander said. ElliQ is a companion for the elderly made by the Israeli company, Intuition Robotics. She initiates conversation with her user and motivates the user to stay connected with loved ones and active physically and mentally. It is named in part, after the Norse goddess that symbolizes old age. What do the conventiongoers think of welcoming a robot into the family? “I don’t know. I guess it would really depend on what you would use it for and what it would do for you,” said Shane Hoalst, who stopped by to look at Buddy. “I think today, people they don’t have time to spend time with elderly people or with children and using that is just perfect, because it looks like a human, interacts like a human, and it’s a gentle product,” said Roseline Le Thomas, who said she could see having a robot for her family. The costs of companion robots vary. Buddy will cost about $1,500. “If you’re going to spend $1,000 on an iPhone, you can spend $1,000 on a little robot like that,” Hoalst said. Just like a dog or a cat, a robot companion may become a regular part of many families in the not so distant future.